Drawing on over 20 years of industry experience, CertaUPS has an unparalleled knowledge of the emergency power market. We are committed to always being ahead of the curve in terms of power protection technologies, which allows us to deliver leading edge solutions for a wide range of industry sectors including healthcare, retail, councils, IT, telecoms and data centres. Key applications: Small office networks, EPOS, CCTV, IT severs and networks and small data centre environments. CertaUPS single phase backup power solutions have been designed exclusively to deliver industry leading resilience. Known worldwide for their cutting edge technology and superior component structure, single phase CertaUPS power protection systems deliver on reliability, flexibility and affordability. Key applications: Server rooms, data centres and industrial. 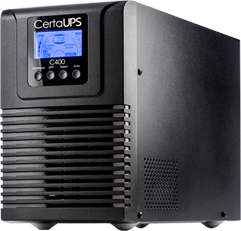 Designed and engineered to the highest quality and performance standards CertaUPS three phase backup power systems deliver leading edge efficiency. They come with a considerably smaller footprint than other comparable three phase UPS systems on the market. The CertaUPS three phase C800 delivers the very latest topologies and impressive high efficiency.